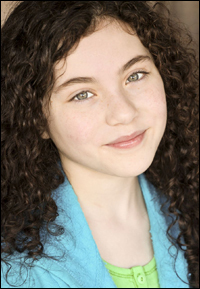 The shooting of the Disney movie Into the Woods is currently underway and it has just emerged that Lilla Crawford, who originated the title role in the 2012 Broadway revival of Annie, is now Little Red Riding Hood replacing Sophia Grace Brownlee. Most of her scenes will be with Johnny Depp who plays the Wolf. As already reported the starry cast includes Meryl Streep as the Witch, Emily Blunt as the Baker's Wife, James Corden as the Baker, Anna Kendrick as Cinderella, Chris Pine as Cinderella's Prince, Johnny Depp as the Wolf, Lilla Crawford as Little Red Riding Hood, Daniel Huttlestone as Jack, Tracey Ullman as Jack’s Mother, Christine Baranski as the Stepmother, MacKenzie Mauzy as Rapunzel and Billy Magnussen as Rapunzel's Prince. They are joined by Tammy Blanchard and Lucy Punch as Cinderella's stepsisters Florinda and Lucinda: Richard Glover as the Steward: Frances de la Tour as the Giant: Simon Russell Beale as the Baker's father: Joanna Riding as Cinderella's mother and Annette Crosbie as Little Red Riding Hood's granny.